This moment, more than any other, is the time when you need to have some really good questions to hand to steer the conversation in the right direction. Questions are like keys which can open the opportunity up and help you get the result you’re looking for but they need to be the right questions. As with keys, if they don’t fit then they open nothing. 1. ‘If you were to give marks out of ten to your current supplier what would that be? If they say ‘7’ for example, you then ask ‘OK, what would they have to do to get to ’10.’ You then go on to explain why you’re an eleven! Needs practice granted but we use it all the time and it works like a charm. 2. If you could change one aspect of the current supplier’s service what would that be? Lovely, lovely question. It sounds quite innocent but makes the prospect start to think about all of the things wrong with the service they’re getting right now. As he tells you he’s giving you nice shiney bullets for your gun later in the call. 3. ‘and would you also agree that it makes good business sense to keep fully aware of the alternative offerings within the market from time to time?’ Notice the word ‘and’ at the start of this sentence, not ‘but.’ ‘But’ puts you on the other side of the argument, ‘and’ puts you side by side. Subtly but very powerful. It’s a question in response to a conversation that is going along the ‘if it’s not broke why try to fix it’ kind of path. By agreeing with that sentiment and then asking him to agree with your other slant there’s little he can do but agree. Once he’s agreed he can’t very well refuse an appointment now can he? Again, needs to be practiced and it’s important to allow the poor guy time to draw breath but it’s about having the right questions at the tip of your tongue. Practice these questions and variations as you see fit and to suit your business. 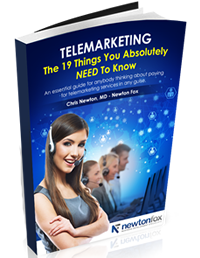 For more information and tips why not take the ‘DIY Telesales’ Course on our free stuff page.